"The labor organizations of the country are to be smashed. The decree has been entered. The orders have been issued. The drive is on. 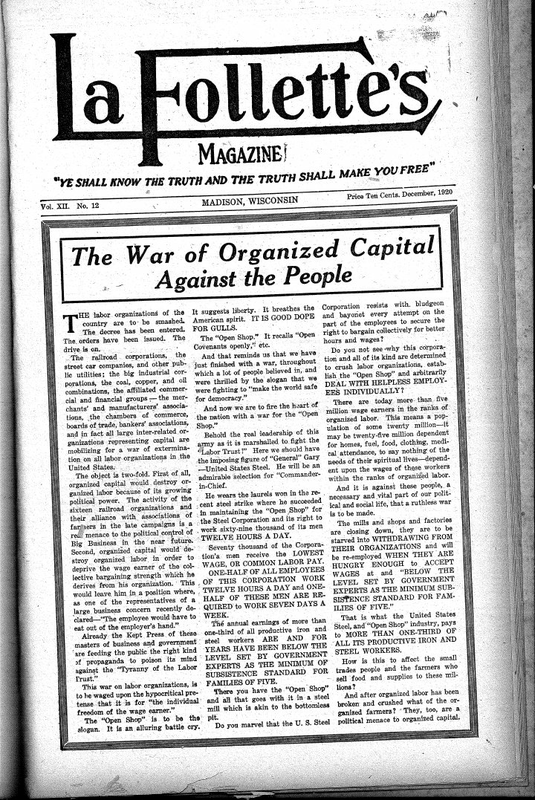 The railroad corporations, the street car companies, and other public utilities; the big industrial corporations, the coal, copper, and oil combinations, the affiliated commercial and financial groups—the merchants and manufactures' associations, the chambers of commerce, boards of trade, bankers' associations, and in fact all large interrelated organizations representing capital are mobilizing for a war of extermination on all labor organizations in the United States. Let the war by Organized Capital go on if it must be. It will entail great suffering. But out of it will come a common understanding for the common good against the common enemy. 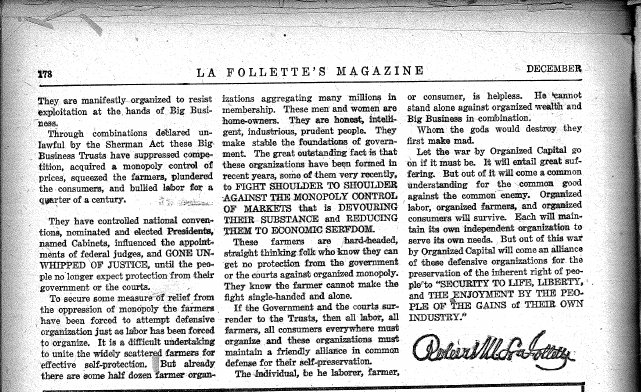 Organized labor, organized farmers, and organized consumers will survive. Each will maintain its own independent organization to serve its own needs. But out of this war by Organzed Captial will come an alliance of these defensive organizations for the preservation of the inherent right of people to "SECURITY TO LIFE, LIBERTY, and THE ENJOYMENT BY THE PEOPLE OF THE GAINS of THEIR OWN INDUSTRY."